Why is it store-bought cookies just never taste as good as homemade? Could it be that, all that hands-on love adds a secret ingredient? I think so! Now everyone has a favorite. 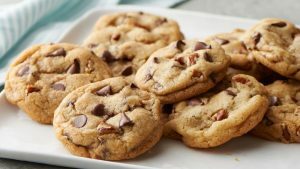 For me, it’s hands down Chocolate Chip, but I like to switch it up a bit and add bits of salted pretzels or crushed potato chips. Yep, that’s right – the salty goodness adds a great layer of flavor and crunch! Love cookies, but are short on time to whip up a batch? Try this baker’s trick. Make some of your favorite cookie doughs ahead of time, then roll them into logs. Wrap tightly in plastic wrap, label, and freeze – that’s it! Then whenever the cookie craving hits you, just pull out a roll, slice off a few cookies then bake – WHA LA! Instant cookies will be ready for that after school snack, or random cookie craving. Need some new ideas – how about a sassy nutty twist – like adding spicy peanuts to your favorite peanut butter cookie recipe. Or try mixing in a touch of lavender and lemon zest to shortbread. Make your gingersnaps extra gingery with an addition of chopped candied ginger! Sometimes things are just better upside down. Bust out the baking dish – I’m talking about delicious Upside Down Cakes! Light and fluffy cake batter encased by a sugary-butter topping and jeweled with chopped fruits – baked until ooey gooey and caramelized. What could be better than that? So versatile and decadent – these cakes are a total crowd pleaser and often seen during the holidays. Pineapple Upside Down Cake is by far the most popular – but there are plenty of variations that are just as scrumptious! Apples, peaches, cherries, or plums – it’s the perfect vehicle for your favorite fruit. This d’lish dessert is sometimes considered a little retro – but that shouldn’t stop you from giving it a try. Throw in some chopped nuts or layer on a boozy caramel glaze for a fun twist. 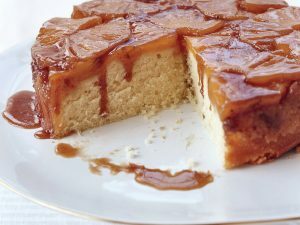 Or throw that rule book out the window and try my Oatmeal Apple Upside Down Cake for breakfast! You can even make mini versions using your trusty cupcake tin as the baking vessel! Preheat oven to 350 degrees F. Spray a 10-inch round cake pan with vegetable cooking spray, and set aside. Mix oats, raisins, cinnamon and nutmeg in a heat-proof container, and pour measured boiling water over mixture. Let sit for 15 minutes. Meanwhile, prepare the apple layer: In a small bowl, mix together the 1 tablespoon brown sugar, 1 tablespoon flour, and the pecans, and pat out into the bottom of the cake pan. Then lay the apple slices out evenly on the brown sugar mixture. Set aside. In a large bowl, combine the 2/3 cup brown sugar, granulated sugar, egg, and oil, and mix well. In a small bowl, mix together the 1 cup flour, soda and salt, then add to sugar mixture. Add plumped oat mixture and stir well. Without disturbing the apple layer, add batter into the cake pan carefully, and then lightly rap pan on counter to release any bubbles. Bake in preheated oven for 35 to 40 minutes, or until cake tests done. Let sit 5 minutes after coming out of the oven, loosen sides of cake from pan with a table knife, and then immediately invert cake onto a large plate. Serve warm or at room temperature, topped with dollops of vanilla yogurt if desired. Bananas, the ultimate all-natural portable snack! Perfect for throwing into your purse or bag when you’re on the go. Besides being deliciously handy, bananas are a great source of potassium and are low in sodium. They are a good source of Vitamin B as well as Vitamin C and dietary fiber. Plus they are naturally fat free! 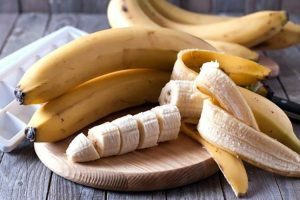 Take an unpeeled banana and make a split lengthwise – just not all the way through. Carve a trough from end to end, keeping the peel. Munch on the removed banana to tie you over, while filling the trough with bits of marshmallow and chocolate and sprinkle with crumbled graham crackers. Wrap the whole thing in tin foil and stick it in the embers like a potato, or over a hot grill. After a few minutes, take it out and carefully unwrap. Yum! And believe it or not, bananas are delicious in savory dishes too. My recipe for Banana Pineapple Chutney is flavored with warm spices like ginger and allspice. It’s a fantastic way to spice up a grilled chicken breast or pork chop. So let’s face it – any way you slice them (or even if you don’t), bananas are d’lish! Great served with basmati rice and vegetable curries as well as grilled scallops, chicken, pork chops or ham. In a heavy, wide, shallow, nonreactive pot, place all ingredients except the fruit. Bring to a boil over high heat and boil for about 4 minutes until mixture is syrupy and slightly reduced. Add currants and pineapple, reduce heat to medium and cook for about 1 minute. Gently fold in bananas and cook until just thickened, about 2 minutes more. Occasionally stir the mixture gently; do not stir roughly—you want to keep the fruit pieces’ integrity. Chutney should be thickened but still slightly juicy. If too dry, add 1 to 2 tablespoons of water. Remove from the heat and let cool. Refrigerate if not serving right away. Chutney should be slightly warm for serving. 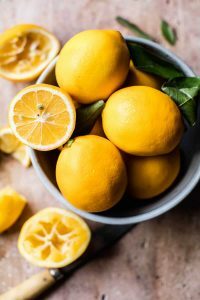 Meyer Lemons – a culinary favorite of mine with its deep yellow hue and fragrant flavor. Rumored to be a cross between a lemon and an orange, this zesty citrus is typically available December through April. So what makes these cuties different from a standard lemon? Meyer’s have pretty “thin skin”, are highly aromatic, and have a sweeter taste than standard lemons. 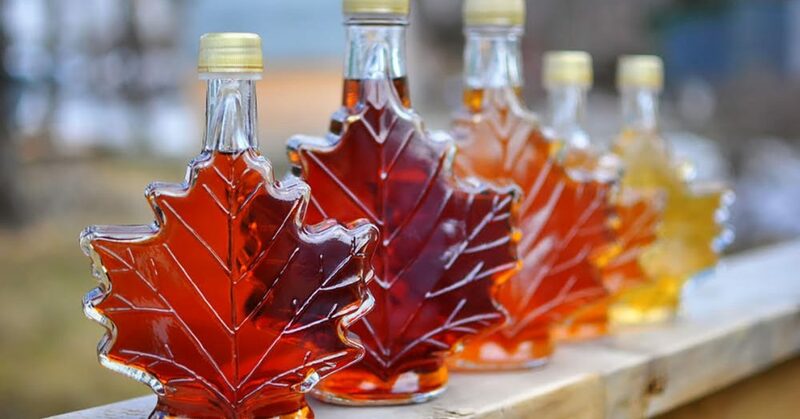 Their delicate flavor works great in cocktails, desserts, and savory dishes too! I like to thinly slice them and roast alongside chicken or pork. The slices are so tasty when eaten with the dish – like in my recipe for Spiced Chicken with Meyer Lemon, Pears & Port. The zest of their peel is fragrant and delicious too – especially when added to shortbread cookies or an Herbed Orzo Salad. So wake up your taste buds with this citrusy delight – and hurry before they’re gone! This is a great entrée for a dinner party. I also love it sprinkled with blue cheese right before serving for a delicious twist. Cut pears in half and core. Cut each half in half and then in half again—to make large chunks. Reserve. In a small bowl, mix the spices and salt. Lay the chicken on a baking sheet or piece of waxed paper or plastic wrap, and sprinkle each piece liberally on both sides with the spice mixture. In a large nonstick skillet or sauté pan, heat the oil over medium-high heat until hot. Sauté half of the chicken for about 3 minutes on each side, or until the skin is deep golden brown and crispy. As the pieces are browned, place them, skin side up, in a 10-by-15-inch baking pan or small roasting pan. Repeat with the remaining chicken. Pour off any excess oil, then sauté the pears, shallots, garlic, and lemon for about 1 minute. Add the port and stir to scrape up the browned bits on the bottom of the pan. Bring just to a boil, and then add the hot mixture, with all the goodies, to the roasting pan, pouring it around, not over, the chicken to keep the browned crust intact. Roast for about 40 to 45 minutes, or until the chicken is opaque throughout and nicely browned on the outside, with an internal temperature of 160 degrees F (chicken will gain another 5 degrees on standing). Transfer the chicken to a platter or individual plates and keep warm. Using a slotted spoon, retrieve the pears, shallots, garlic, and lemon slices from the sauce and distribute them over the chicken. Place the roasting pan on a burner on high heat and cook to reduce the sauce to about 3/4 cup. (If you like your sauce to have a bit more body, mix 1 teaspoon of cornstarch with 2 teaspoons of water until smooth and whisk into the reducing sauce. Cook till lightly thickened.) Taste the sauce for seasoning, adjust if needed, then drizzle the sauce over the chicken and goodies. Scatter with parsley leaves for garnish. Bring 3 quarts of water to a boil in a large pot over medium-high heat. Stir in orzo and cook for approximately 6 – 7 minutes, stirring often, until just al dente or per package instructions. Immediately drain well, then place orzo in a heat-proof bowl. Stir in butter, olive oil, shallots and herbs to coat well. Then stir in lemon juice, zest, seasonings and cheese. Serve immediately. When I think of my childhood favorite after school treat, hot chocolate always comes to mind. But cocoa isn’t just for kids – that’s right adults! Jazz up the flavors with savory and spice add in’s – like infusing cardamom pods and cinnamon sticks into the base. You can even add in a chili pod for some heat! You can switch it up in other ways too – for those avoiding dairy, there are lots of options these days. Coconut or almond milk make great alternatives. Turn your cocoa into a cozy night-cap by stirring in a little honey whiskey or your favorite liqueur. And if you’re feeling extra adventurous, you’ve got to try my luscious Red Wine Sipping Chocolate. This rich and creamy version combines sultry dark chocolate, a bold lush red wine and a touch of honey for sweetness. For even more decadence, top it off with a big fat toasted gourmet marshmallow (get the blow torch out!) and finish it with a sprinkle of red wine salt. That’s not your mama’s cocoa! 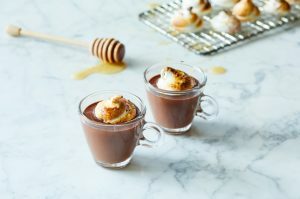 This hot chocolate combines three beloved ingredients: honey, chocolate and red wine – yes wine! It’s rich, delicious and meant to be sipped and savored. For even more decadence, top with toasted hand-made Honey Marshmallows, drizzle with honey and sprinkle with red wine salt. Combine the chocolate and wine in a small saucepan over low heat and whisk until the chocolate is melted, about 3 to 5 minutes. Add the milk and honey, increase heat to med-low and continue to heat until hot but not boiling. Remove from heat and pour into small cups for serving. Garnish with toasted marshmallows sprinkled lightly with red wine salt if desired. *Red wine salt is available online. Hail the mighty almond! The crunchy nut that’s packed with flavor and healthy goodness. Available in many forms – raw, slivered, flour, milk, butter, and oil – this nutty ingredient can be used in both savory and sweet dishes. And talk about versatile! It’s so easy to integrate them into your diet. That’s a good thing too – because this superfood is SUPER healthy! Packed with Vitamin E and rich in dietary fiber and healthy fats. Plus they are a super protein source and easy to have a little snack baggie around for when you’re feeling hangry! Chopped up and added to salads, grain bowls, or your morning yogurt, they’ll keep you feeling full and keep your body’s metabolism on track. My Cranberry Almond Crunch Slaw is the perfect healthy snack or side dish. So go nuts! Nuts for Almonds, that is. In a large bowl, whisk together vinegar, honey, sour cream, salt and Sriracha. Add green onions, cabbage, cranberries and cilantro and toss until well coated. The salad should sit for 30 minutes before serving. If making way ahead, refrigerate dressing and salad ingredients separately, then toss together 30 minutes before ready to serve. 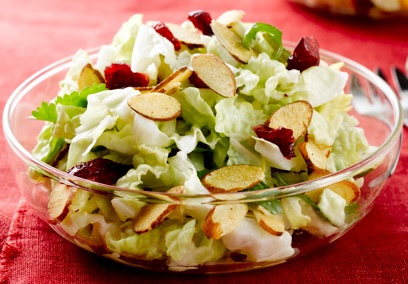 Toss the almonds into the salad right before serving.